Description: Meg Vaillancourt reports that a disproportionate number of African Americans have been infected with the HIV/AIDS virus. Vaillancourt reports that higher rates of transmission in the African American community are due to behavioral factors. Vaillancourt analyzes the differences in AIDS transmission between the white community and the African American community. Footage of Denise Cartier-Bennia giving a talk on educating people about AIDS in the African American community. Vaillancourt quotes statistics concerning HIV/AIDS infection rates. Report is accompanied by footage of African American residents of Roxbury and footage from interviews with people on the street. 1:00:07: Visual: A reporter on conducts interviews with African American men and women. An African American man says that he is "scared to death." An African American woman says that she doesn't know if "it is stronger on the white end or if it's stronger on the black end." 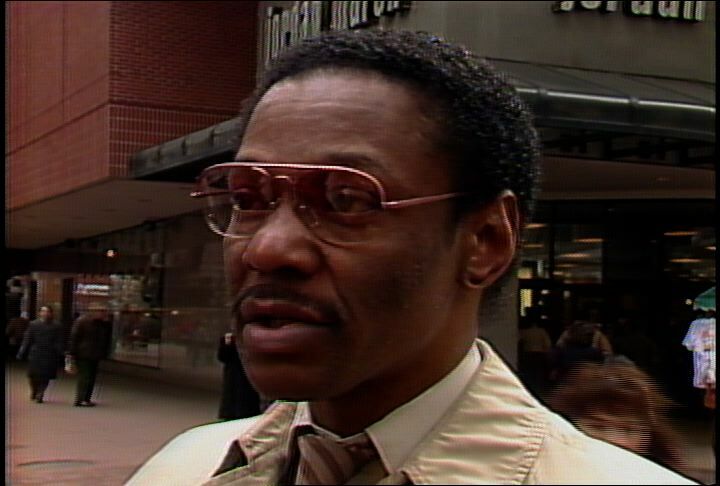 Another African American man at Downtown Crossing says that no African American stars have died of AIDS; that he fears the development of an"unwarranted stigma" on the African American community due to AIDS. Shots of African Americans walking on a commercial street. Meg Vaillancourt reports that a disproportionate number of African Americans have been diagnosed with AIDS in the US. V: A chart list statistics on screen. The statistics read that 25% of AIDS victims are African American. Vaillancourt reports that African Americans represent 12% of the population. Shot of an African American woman with her back to the camera. Statistics read that African American women are 13 times more likely to get AIDS than white women; that Hispanic women are 11 times more likely to get AIDS than white women. Shots of an African American infant being examined by a white female doctor. Statistics read that 82% of infants with AIDS are African American; that 91% of infants with AIDS are non-white. Footage of Denise Cartier-Bennia (professor) saying that AIDS is affecting whole families in the African American community. Shot of a group of African Americans waiting for public transportation. Vaillancourt reports that the mode of transmission for AIDS is different in African American and white communities. V: Statistics read that homosexual/bisexual AIDS patients are 73%white, 16% African American and 11% Hispanic. Statistics read that heterosexual AIDS patients are 50% African American, 25% Hispanic and 25% white. Footage of Cartier-Bennia speaking. Shots of a group of African American teenagers crossing an urban street; of a drug user preparing a dose of heroin. Vaillancourt reports that Cartier-Bennia has studied the factors contributing to the high rate of AIDS in the African American community. V: Statistics read that African American women are 5 times more likely to get AIDS from contact with a drug user than from contact with a bisexual man. Shot of a group of African Americans boarding an MBTA bus. Vaillancourt reports that the immigration of infected immigrants from Haiti and Africa may be escalating the problem. V: Shots of military recruits laying down barbed wire in a field. Statistics read that 0.9 out of 1000 white military recruits test positive for the AIDS antibody; that 3.9 out of 1000 African American military recruits test positive for the AIDS antibody. Footage of Cartier-Bennia talking about the appearance of the AIDS antibody in military recruits. Cartier-Bennia says that one out of every 250 recruits was infected; that 10% to 30% of these recruits will eventually develop AIDS. Cartier-Bennia says that the African American community is in a "precarious position." Vaillancourt reports from a street corner. Groups of African Americans wait for public transportation across the street. Vaillancourt notes that AIDS is not an African American disease; that behavior creates the risk of transmission, not race. V: Footage of Cartier-Bennia saying that risky behavior leads to aids; that knowledge may be the most effective weapon against AIDS; that African American and Hispanic politicians have been silent on the subject of AIDS and the minority community. Shot of a group of African Americans boarding an MBTA bus. Footage of Cartier-Benia talking about the unwillingness of African American churches to discuss AIDS. Shot of an African American man crossing a street. Footage of Cartier-Bennia saying that AIDS is another problem which needs to be tackled by minority communities if they want to survive into the year 2000. Shots of African American children; of African Americans on the street; of African Americans waiting for public transportation. 1:00:01: Visual: Shots of medical laboratory workers undertaking the processes involved in testing vials of blood. Callie Crossley reports that businesses and insurance companies have been lobbying for the right to test for the AIDS antibody. Crossley reports that Paula Gold (Secretary of Consumer Affairs) and the administration of Michael Dukakis (Governor of Massachusetts) have decided to allow testing for life insurance. V: Footage Gold at a press conference. Gold says that testing will be allowed under limited circumstances and under controlled conditions. Crossley reports that critics complain that the proposed policy favors insurance companies; that Peter Hiam (former Insurance Commissioner) resigned in protest of the policy. Crossley reports that the Urban League of Eastern Massachusetts also disagrees with the proposed policy. V: Footage of Don Polk (Urban League of Eastern Massachusetts) at a press conference. Polk says that involuntary testing of any segment of the population should only take place for clear public health reasons; that involuntary testing will have a "chilling effect" on those who have a reason to seek testing; that involuntary testing includes tests taken as a precondition for life insurance. Shot of a white audience member at the press conference. Crossley adds that Polk says that some provisions of the policy discriminate against African Americans; that African Americans are more likely to purchase life insurance policies for under $100,000. Crossley reports that the new provisions state that purchasers of life insurance policies under $100,000 will not get payment if they die of AIDS within two years of purchasing a policy. V: Shots of African Americans waiting for public transportation in Roxbury; of an African American man crossing the street; of African Americans boarding an MBTA bus. Footage of Polk at the press conference. Polk refers to evidence that African American AIDS patients have an average life expectancy of three to nine months after their initial diagnosis; that white victims have an average life expectancy of two years. Polk says that the proposed policy fails to take into account the discrepancies between African American and white life expectancies. Shot of an African American woman in the audience. Crossley reports that a spokesperson from Gold's office said that Gold "did not feel that the regulations discriminated against blacks." V: Shot of Gold speaking at a press conference. Crossley notes that Polk does not think that the proposed regulations go far enough in guaranteeing confidentiality. V: Shot of an African American man taking notes at Polk's press conference. Polk says that there are confidentiality measures in the regulations; that there is no enforcement mechanism to ensure adherence to those measures; that we live in an age of "rapid information processing." Shot of a "public health fact sheet" released by the Massachusetts Department of Public Health; of public health informational brochures about the AIDS virus. Crossley says that the Urban League accuses the new regulations of taking emphasis away from public health education and initiatives. Crossley notes that Polk says that public health campaigns are important in minority communities; that African Americans make up 25% of the 25,000 current AIDS victims. Crossley reports that the Urban League will recommend at a public hearing that the new proposed policy be rejected. Description: Burned out and abandoned buildings and houses. Narrow spaces between tall houses. Footage shot for a moving vehicle. Roxbury highlands. Description: Interviews with Dorchester residents on Dorchester Fair Share's effort to get HUD or city of Boston to sell vacant properties to people who would rehabilitate them and pay taxes. B-roll of abandoned house on Bowdoin Street, Dorchester. Trashed interior. Other houses with boarded up windows. 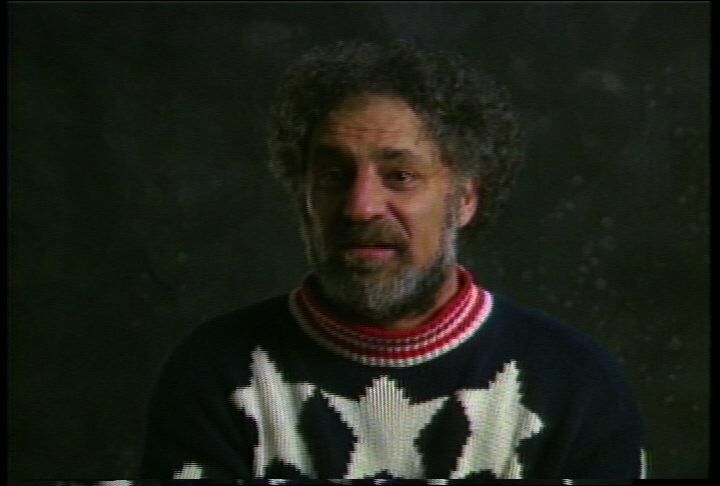 Description: Abbie Hoffman is posthumously remembered for his career as a political activist. Footage of Hoffman's theatrics from political rallies and appearances from 1960s-1980s. Clips of reporters talking to Hoffman during his last activism and trial participation in Northampton, Mass. Description: Deborah Wang reports that minority workers are underrepresented in the advertising industry. Wang interviews Bink Garrison (President of Ingalls, Quinn and Johnson) about the lack of minority workers in the industry. Wang's report includes footage of workers in the offices of Ingalls, Quinn and Johnson (advertising firm). Wang reports that Ingalls, Quinn and Johnson is participating in industry efforts to attract students into the industry. Wang notes that the Ad Club at English High School teaches students about advertising. Wang reports that Ad Club students wrote and acted in a public service announcement last year. Wang's report includes footage of the public service announcement produced by the Ad Club. Wang's report also features interviews of Pam Piligian (Ingalls, Quinn and Johnson) and students working in the Ad Club. 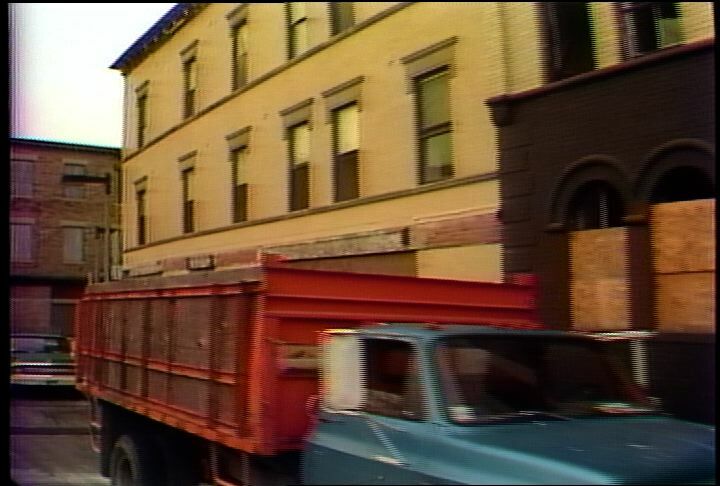 B-roll follows of workers at the offices of Ingalls, Quinn and Johnson, interiors of the lobby, closeups on advertisements. 1:00:13: Visual: Footage of white workers in the offices of Ingalls, Quinn and Johnson advertising agency. Deborah Wang reports that most of the workers at the Ingalls, Quinn and Johnson advertising agency are white. V: Shots of workers discussing projects and working at their desks. Footage of Bink Garrison (Ingalls, Quinn and Johnson) being interviewed by Wang. Garrison says that Ingalls, Quinn and Johnson is typical of the advertising industry; that it is hard to break into the advertising industry. Shot of a young African American male working on a project at Ingalls, Quinn and Johnson. Footage of Garrison saying that talented minority students do not often choose to enter the advertising industry because entry-level salaries are low. Wang reports that minority workers are underrepresented in the advertising industry. Wang reports that the Ad Club at English High School teaches students about advertising and the advertising industry. V: Footage of white and minority students working on ads and discussing projects at the Ad Club. The students are in a classroom. Wang reports that students from the Ad Club wrote and acted in a public service announcement last year. V: Footage of the public service announcement about the importance of a high school diploma. Footage of an African American male student and an African American female student practicing lines for another public service announcement. Footage of Pam Piligian (Ingalls, Quinn and Johnson) saying that the students will be producing public service announcements for radio this year; that the kids are enthusiastic about the project. Footage of Michelle Wilcox (11th grade student) saying that the advertising projects allow her to express herself and her opinions. Wang reports that the advertising industry is trying to recruit minority workers through efforts like the Ad Club; that the industry is working to provide internships and mentors to students. Wang notes that the industry leaders hope that a few of the students will end up choosing a career in advertising. V: Footage of Garrison saying that the program introduces students to the industry; that the program allows students to become acquainted with the business world. Shots of minority students in the Ad Club. Description: Marcus Jones reports that drug addicts and community leaders held a demonstration in front of the Massachusetts State House, lobbying for more funding for drug treatment centers in Massachusetts. There are not enough publicly funded treatment programs to meet demand. Demonstrators hold signs and chant. Reverend Graylan Hagler and others address the demonstrators. Hagler says that access to drug treatment is a class issue. State Rep. Gloria Fox tells demonstrators to let state legislators know that drug treatment centers are needed. Interview with recovering addict David Watson about the need for treatment centers. Interview with another recovering drug addict who says that she intends to register to vote. Jones reports that the demonstrators went into the State House to register to vote after the rally, and they intend to vote against legislators who do not support their cause. 1:00:15: Visual: Footage of a demonstration in front of the Massachusetts State House. Supporters of treatment facilities for drug addiction are gathered. A man leads the demonstrators in a cheer. Shot of a sign reading, "Don't treat addiction as a crime. Treat it as a disease." Marcus Jones reports that hundreds of people were expected to attend today's demonstration outside of the State House; that rainy weather may have kept some demonstrators away. Jones notes that the demonstration went on as planned; that the demonstrators are committed to their cause. V: Shots of speakers and attendees at the demonstration. Footage of Nathaniel Askia (drug treatment provider) addressing the crowd. Askia tells the demonstrator to remain committed to the cause. Askia predicts that the movement will be successful. Shot of a button pinned to the shirt of a demonstrator. The button reads, "Treatment on demand." Jones reports that the demonstrators support drug treatment on demand; that the demand for drug treatment in Massachusetts is growing. Jones notes that over 1,000 drug addicts are turned away from treatment facilities each day in Massachusetts; that there are not enough publicly funded treatment programs to meet the demand. V: Shots of the demonstrators. The demonstrators carry umbrellas and wear hats to protect themselves from rain. Footage of Reverend Graylan Ellis-Hagler (Church of the United Community) addressing the crowd. Ellis-Hagler says that access to drug treatment is a class issue. Ellis-Hagler says that Kitty Dukakis (wife of Governor Michael Dukakis) has access to treatment because she belongs to the upper class. Ellis-Hagler says that class, race, gender, and sexual preference may bar some from treatment for their addictions. Jones reports that David Watson (recovering drug addict) was recently admitted to a treatment program; that Watson is recovering from 24 years of substance abuse. V: Footage of Watson being interviewed by Jones. Watson says that citizens will end up paying the price if more treatment centers are not built. Watson says that addicts are likely to steal and commit crime in order to pay for their habits. Watson says that he began stealing to support his habit at one point in the past. Footage of the supporters cheering at the demonstration. A leader leads the supporters in chanting, "What do we want? Treatment. When do we want it? Now." 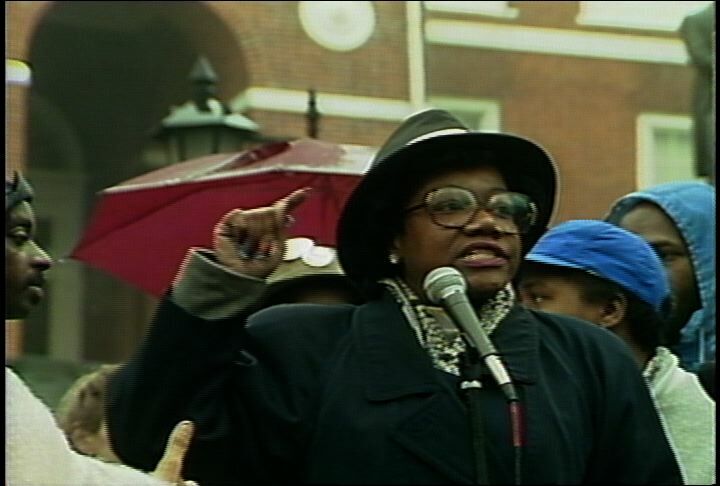 Footage of Gloria Fox (State Representative) addressing the crowd. Fox says that the demonstrators must let the legislators know that drug treatment centers are needed; that the legislators will soon begin work on the state budget. Footage of Brenda (recovering drug addict) being interviewed by Jones. Jones asks Brenda if she has registered to vote. Brenda says that she is going to register to vote today. Brenda says that she intends to vote; that she thinks her vote will make a difference. Jones stands outside of the State House. Traffic passes on the street behind him. Jones reports that demonstrators went into the State House to register to vote after the rally. Jones reports that the demonstrators will vote against legislators who do not support an increase in the present drug treatment program. Description: Meg Vaillancourt interviews Sterling Anderson of the Association of Community Organizations for Reform Now (ACORN) outside of the Dudley Branch Library about the lack of affordable housing in the Roxbury, Dorchester, and Mattapan areas. Anderson says that the city is not doing enough to provide affordable housing for low-income residents. Anderson questions the city's definition of low-income. He adds that most residents do not make enough money to meet the city's definition of low-income. Anderson and a group of ACORN protesters march to the offices of the Boston Redevelopment Authority on Washington Street in Dudley Square. Anderson and the protesters enter the office and confront Ricardo Millet of the Boston Redevelopment Authority (BRA) about the city's affordable housing policies. The protesters read a list of demands including that 70% of all new developments in the area must target low and moderate-income residents. The protesters demand information on all new planned developments in the Roxbury/Dorchester/Mattapan neighborhoods. Millet discusses the city's affordable housing policy with the protesters. He gives them handouts including a list of planned developments in the area. Millet says that the BRA is trying to provide affordable housing despite a lack of subsidies from the federal government. 1:00:14: Visual: A fire engine pulls out onto Washington Street. Elevated train tracks are visible. An African American firefighter operates the rear of the truck. Cars pull to the side of a congested street to let another fire engine pass. 1:01:22: V: Meg Vaillancourt sets up an interview with Sterling Anderson (ACORN). Vaillancourt asks about the march organized by ACORN (Association of Community Organizations for Reform Now) to protest the affordable housing policies of the Boston Redevelopment Authority (BRA). Anderson says that redevelopment in the areas of Roxbury, Dorchester, and Mattapan is not geared toward the current residents of those areas; that ACORN is trying to put pressure on the mayor and the BRA to include housing for current residents. Anderson says that most of the residents of those areas do not make more than $13,000 per year; that one-bedroom apartments are selling for $18,000 in one of the new developments. Anderson says that Ray Flynn (mayor of Boston) deserves credit for developing housing; that these efforts are insignificant if the residents of these areas cannot live in the new housing. Anderson talks about how poor people have been thrown out of areas like the South End. Anderson says that the residents need housing, not shelters; that the city needs to commit itself to affordable housing. Anderson says that the city defines low income as a salary of $18,000 to $23,000 per year; that the city defines a moderate income as an income of $23,000 per year. Anderson says that he defines low income as under $13,000; that he defines moderate income as $13,000 to $24,000 per year. Vaillancourt asks if the city is really serving its lower income residents. Anderson says that the city is not serving those residents; that a lot of people cannot afford housing; that the city is pushing low-income residents out of the areas of Roxbury, Dorchester, and Mattapan. Vaillancourt asks if race is the issue. Anderson says that it is an economic issue; that the low-income residents of Roxbury are African American; that there are low-income whites with the same problems in South Boston, Chelsea, and East Boston. Vaillancourt asks if Anderson doubts Flynn's commitment to the neighborhoods. Anderson says that he respects Flynn; that Flynn needs to understand that low-income residents are committed to fighting for affordable housing; that he needs to help these people. Anderson says that he cannot afford to give up on the fight for affordable housing; that he will have no place to live in five years if he does not put up a struggle. Anderson says that shelters are not the answer to the housing problem; that poor people do not want to live in shelters. Anderson says that there are some people who benefit from shelters; that the majority of people with low incomes are intelligent and hard-working. Anderson says that he hears the same statistics from the city at every meeting on affordable housing; that the city needs to make a commitment because working people cannot afford housing right now. The crew takes cutaway shots of Vaillancourt and Anderson. Anderson says that the BRA says the same thing at every meeting; that public housing advocates are always pushing for more low-income housing. Anderson says that 70% of the housing in the areas of Roxbury, Dorchester, and Mattapan needs to be for low- and moderate-income people. Anderson says that people in these areas have no place to live, despite the BRA's commitment to affordable housing; that developments in these areas should be priced at $35,000 instead of $65,000. 1:08:18: V: Housing protesters gather on the sidewalk on Washington Street, outside of the BRA's Dudley Office. The elevated train tracks are visible. The protesters chant, "We want housing. We won't wait. 2, 4, 6, 8." The protesters gather behind a banner reading, "ACORN." Shot of the BRA sign above the entrance to the office. The protesters march slowly into the BRA offices. The protesters chant, "What do we want? Housing. When do we want it? Now." The majority of the protesters are African American. The protesters file into the building. 1:10:48: V: The housing protesters enter a large room swith chairs set up for a meeting. The protesters chant, "2, 4, 6, 8. We want housing. We won't wait." The protesters stand at the side of the room, holding protest signs and chanting. Shot of a sign reading, "Third notice: Please be advised that you are required to build affordable housing." Shots of individual protesters. Ricardo Millet (BRA) sits in one of the chairs in the meeting room. He watches the protesters with interest. Millet invites the protesters to sit down. Anderson says that the protesters will remain standing. Anderson addresses Millet. Anderson says that there is a housing shortage in the areas of Roxbury, Dorchester, and Mattapan; that the BRA housing policy is ineffective; that residents of these areas need housing that they can afford. Anderson says that the newly developed housing target people with incomes of at least $23,000 per year; that most residents make less than $13,000 per year. Anderson says that the BRA and the city of Boston need to make a commitment to low-income housing; that 70% of the new development needs to target low-income residents. Anderson demands information on new developments planned for the Roxbury, Dorchester, and Mattapan areas. Anderson says that the BRA has not been forthcoming with that information; that the BRA needs to work with developers work with developers who have committed to building low-income housing. 1:14:34: V: An African American woman addresses Millet. She reads a list of ACORN demands: the cessation of development on Fountain Hill by June 15 unless the development is 70% affordable to those with low- and moderate-incomes; 70% of all new housing must target low- and moderate-income residents; that ACORN wants information on plans for new development in the area. Another protester says that the 70% quota applies to housing in the Roxbury, Dorchester, and Mattapan areas; that many residents of these areas make less than $13,000 per year; that an average income is more than $26,000 per year. The protester says that the voices of the poor must be heard. The protesters applaud. Anderson asks for a map of planned developments in the Roxbury/Mattapan area. Anderson says that the protesters will not allow new developments to be built if they cannot live in them. Millet stands to face the protesters. He listens as Anderson speaks. 1:16:10: V: Millet addresses the protesters. He invites the protesters to sit down and to discuss the issues with him. Anderson says that the protesters have been sitting in meetings for months; that the protesters want a list of the planned developments in the area. Millet says that he has never been asked for a list of the planned developments before now. Millet offers to provide the protesters with a list of projects currently undertaken by the BRA. Millet gives copies of a handout to the protesters. Millet notes that the BRA, under the Flynn administration, has approved 912 units of housing. Millet adds that the handout includes a list of approved projects as well as their locations, developers and affordablility. Shot of the printed handout. Millet says that 60% of the units in the approved developments are affordable to low- and moderate-income people. Shot of statistic on the handout reading, "60.4% of units below market rate." Anderson asks Millet to define low- and moderate-income. Millet says that the BRA will work with the protesters on the issue of low-income housing; that the BRA and the city want to respond to the needs of low-income people. Millet notes that it is hard to achieve these goals because the federal government has stopped subsidizing housing. Millet adds that the city has done well to achieve a 60% affordability rate in its new projects. Millet gives out copies of another handout. Millet explains that the handout covers the BRA's and the city's positions on affordable housing; that the handout describes the problem of affordable housing. Millet notes that the city is aware of the housing shortage. Anderson says that he gets the same responses every time he meets with the city and the BRA about housing; that no one is responding to their concerns. Shot of the crowd of protesters. Millet says that he has met with ACORN representatives in the past; that the BRA agrees with ACORN on the need to provide affordable housing; that the BRA is trying to achieve these goals without subsidies from the federal government. Millet stresses the fact that the BRA is committed to achieving these goals; that the BRA is trying their best to build affordable housing; that the BRA's achievement of a 60% affordabliltiy rate is remarkable. Description: Carmen Fields reports on differing opinions of the African American studies program at Harvard University. Interviews with Harvard professors Harvey Mansfield and Orlando Patterson. Mansfield says that conservative scholars are excluded from the African American studies program at Harvard. He adds that the program is too political and not concerned enough with the study of the African American experience. Mansfield calls African American studies an "advocacy major" which promotes a certain point of view. Patterson notes that many academic departments are too political. He adds that history and English departments also often teach history from only one perspective. Patterson says that African American studies offers an inter-disciplinary approach to the study of one area of life. Patterson discusses his concerns over the lack of African American scholars entering academia. Fields's report is accompanied by footage of the Harvard campus and footage of students in a class taught by Derrick Bell at the Harvard Law School. 1:00:05: Carmen Fields reports that Harvey Mansfield (professor, Harvard University) has been a professor of government at Harvard University since 1965; that Orlando Patterson (professor, Harvard University) has been a professor of sociology at Harvard since 1970. Fields says that both men believe that students should learn about the African American experience; that Mansfield is critical of how it has been taught. V: Shots of Mansfield; of Patterson; of Harvard students in a lecture hall. Footage of Mansfield being interviewed by Fields. Mansfield says that teaching on the African American experience has been politicized; that teaching on the African American experience has been forced to be "politically correct." Mansfield says that the Afro-American Department at Harvard is too concerned with questions of power and the status of African Americans at Harvard; that the Afro-American Department is not concerned enough with the black experience in America. Shots of Harvard students in a lecture hall. Fields reports that Mansfield believes that African American Studies departments have lost sight of the richness and diversity of the African American experience. Fields reports that Mansfield believes that "leftists" and "liberals" are encouraged in the departments; that Mansfield believes that African American conservatives are ignored. V: Footage of Mansfield being interviewed by Jones. Mansfield says that African American conservatives are not welcomed by the Afro-American Department at Harvard. Mansfield says that the limited scope of the department has a bad effect on the university. Shot of Harvard Yard through one of the gates. Fields reports that Mansfield believes that African American studies departments turn academics into activism. Fields reports that Mansfield says that African American Studies departments and Women's Studies departments design their majors to promote particular points of view. V: Shot through an iron gate of the window to a classroom. Footage of Mansfield being interviewed. Mansfield says that "advocacy majors" promote certain points of view. Mansfield says that the classes for these majors presuppose a certain viewpoint; that questions are not raised; that professors address a "rally" of like-minded people. Footage of Patterson being interviewed. Patterson says that many history and English departments contain like-minded professors and like-minded students; that many of these departments take a narrow view of their subject. Patterson says that American history was taught in a narrow way until the 1960s and 1970s; that history and English are still taught in a narrow way in some places. Fields reports that Patterson agrees that overly politicized departments are a problem; that Patterson is more worried about a lack of African American scholars. Fields reports that there has been a decline in African American scholars since the late 1960s. 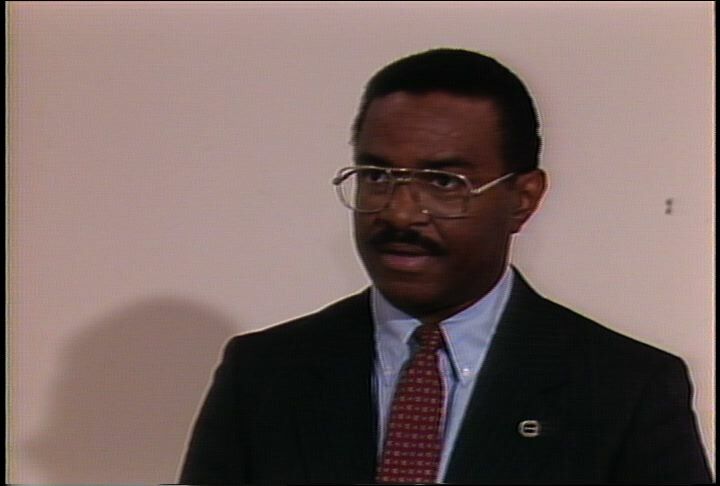 V: Shot of Derrick Bell (Professor, Harvard Law School) teaching a class at Harvard Law School in December of 1990. Shots of the students in Bell's class. Footage of Patterson being interviewed. Patterson says that he is concerned about the low numbers of African American students entering graduate schools in all areas. 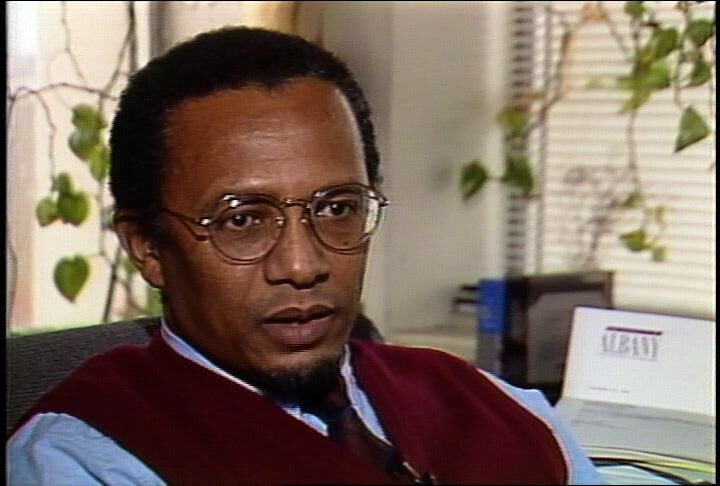 Patterson says that the African American culture does not have an "intellectual tradition." Patterson says that African American culture has made major contributions to American life. Fields reports that African American Studies departments may encourage more African American students to pursue higher education in a variety of fields. V: Shots of students on the Harvard campus; of Bell teaching a class; of an African American female student in Bell's class. 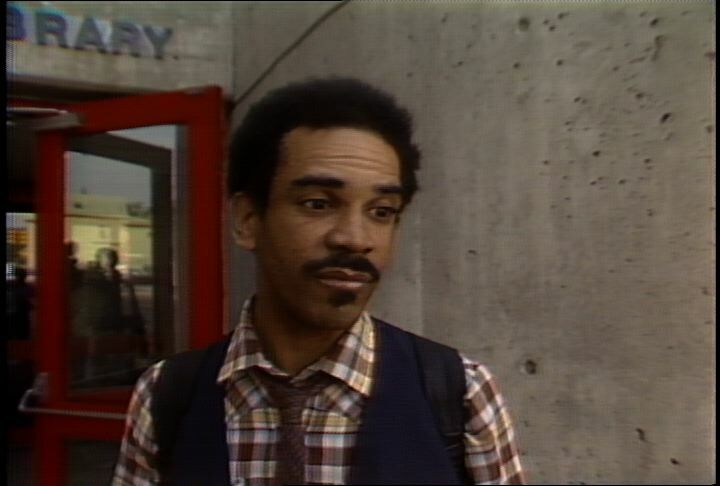 Footage of Patterson saying that African American Studies offers an inter-disciplinary approach to the study of a particular area of life. 1:00:11: V: Footage from the Arsenio Hall Show. Charles Cozart (comedian) tells jokes in front of the audience. Marcus Jones reports that the African American community is debating the use of the term "black." Jones notes that Jesse Jackson (African American political leader) is urging the use of the term "African American" instead of "black." V: Shots of Jackson addressing an audience. Shots of African Americans in the audience. Footage of Robert Hayden (Lecturer, Northeastern University) saying that many people of color have been calling themselves "African Americans" for years. Hayden says that many universities have departments of African American studies. Hayden says that people of African descent were living in Boston in the eighteenth century; that those people referred to their community as "African." Hayden says that the term is "accurate" and "useful." 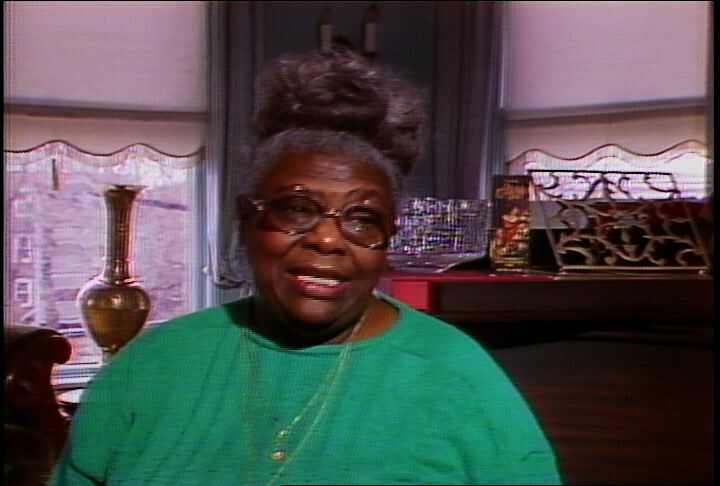 Footage of Elma Lewis (Director, National Center of Afro-American Artists) being interviewed by Jones. Lewis says that she does not have to follow the trend. Jones notes that Lewis is opposed to using the term "African American." V: Footage of Lewis saying that Africa is a whole continent. Lewis says that the terms "Nigerian American" or "Jamaican American" are more appropriate than "African American." Lewis says that the term "black American" is more inclusive. 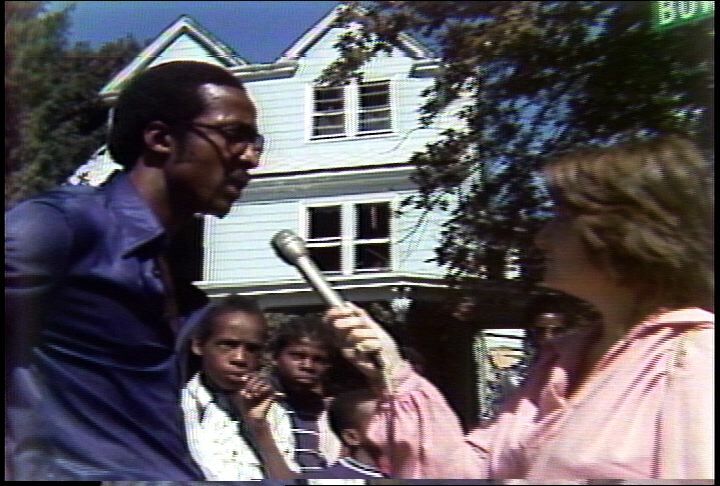 Footage of Jones addressing a class at the David A. Ellis School in Roxbury. Jones asks how many of the students are aware of the debate surrounding the term "African American." A few students raise their hands. Jones says that he asked students and teachers at the Ellis School in Roxbury about the terms "African American" and "black." V: Shots of students. Footage of an African American female student saying that it does not matter which term is used. Footage of a Latina teacher saying that there should be no mention of race in identification terms. Footage of an African American teacher asking if the term would be extended to "Afro-English" for blacks living in England. Footage of an African American male student saying that he likes the term "brown." Footage of a female student saying that it doesn't matter. Footage of Hayden saying that the term might inspire some to think about their African roots. Hayden says that some people might begin to look into their family histories. Footage of Lewis saying that it is important to teach children to be proud of their African roots. Lewis says that not all black people in the US are American; that all black people in the US are black. Shots of African Americans walking on a street; of a group of students walking away from a school.